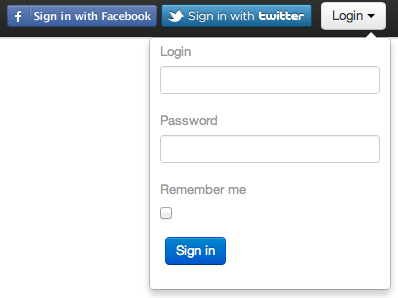 Working on a new website for fun that leverages Twitter Bootstrap (until the day comes that I can do any of the UI myself), I recently decided to try to integrate my login form with Twitter Bootstrap’s navbar dropdown to eliminate the need for a separate login page. The code was pretty simple, following the documentation on the website and dropping in my Rails ERB form (I’m leveraging Devise for authentication). Fortunately, it is pretty easy to stop this from occurring by stopping the click event from bubbling up. By creating a click handler on my “dropdown-login” tag, I was able to stop the propagation of the event, which allowed my form to work as desired.